Kolkata, April 16: With the sky touching height of 268m, Kolkata high-rise building becomes the tallest in India. 'The 42' located in the Chowringhee area took the tallest building crown from 'The Imperial' in South Mumbai's Tardeo. With the magnificent height and picturesque view of the Howrah Bridge, The 42 has reshaped Kolkata's skyline. Huge Fire Erupted at 'The 42', Kolkata's Tallest Skyscraper. "The combined efforts of the city’s top developers have led to a magnificent structure that extends to a height of 260m above sea level. Located at the prestigious venue of Chowringhee, The 42, is the tallest building in Eastern India. 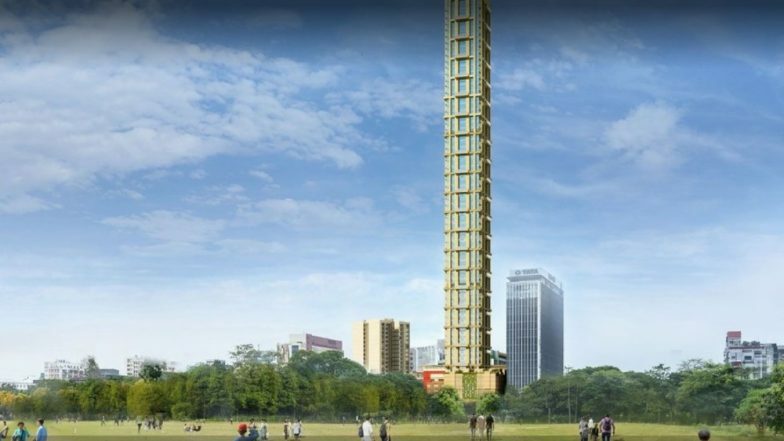 With the height comes a magnificent 360-degree view that travels past the horizons of the Howrah Bridge," said The 42 in its official website. The next tallest is The Imperial Towers, a residential complex, at 256m in Mumbai. The architectural height of the building is 840 ft with 60 floors above the ground. The list is followed by Ahuja Towers and Lodha Bellissimo Tower 2 at 248.5m and 222m respectively.